Frequent travelers love nothing more than to reminisce about those blissful vacation days spent soaking up the sun with cocktails in hand. But, as any frequent traveler can tell you, it is easy to forget all the special little details of a trip. Unfortunately, it won’t be long before you forget about that cafe you loved in Brussels or the name of the nice man you met on the train to Sydney. So unless you take lots of pictures and write things down, chances are those precious memories of some of the best days of your life will start to fade away into oblivion. So, how do you keep these great memories at the forefront of your mind? Create an amazing travel journal that will encourage you to write, and then read later! Why should you create a travel journal? Pictures are great, but they won’t help you remember that amazing pasta dish you tried in Naples or how the weather made you feel as you strolled Waikiki Beach. Taking the time to create a travel journal is a labor of love, but one that is so richly rewarding – especially years later. A travel journal can be a place where you jot down bucket list items and organize your research and it can be a beautiful collection of photos, memorabilia and recollections merged together as your own personal travel story. Having a journal you are excited to use will help you remember more of your trip as you jot down encounters and fun anecdotes and it can help to keep you rooted in the present as you reflect on the amazing experiences you’re enjoying on your vacation. It also helps if you’ve ever had post-trip blues; writing in your travel journal on the flight home really helps to thwart that depression by allowing you to relive your favorite experiences. It’s your journal, so you can include as little, (or as much) as you’d like in it; but usually, the most successful journals are those that can be enjoyed year-round. To spark excitement for future trips, try using your journal to plan your upcoming vacations. You can include your budgets, lists of things you want to enjoy while at your destination, your master packing list and any helpful notes, tips or tricks that you find that will make your life easier while traveling. Then when you’re finally on your dream trip, try to be as detailed as possible so you can recall those blissful days with clarity even years later. Try to carve out some time every morning or before bed to write out some thoughts about your experiences that day. Be explicit and use all of your senses: write about how your appetizer tasted, or how the ocean sounded, or the way the local market smelled as you meandered through to your destination. Make lists of the people you met or your favorite moments of the trip. Include pictures, wrist bands from experiences, tickets, menus from restaurants or trinkets that strike your fancy. Any souvenir that will transport you back to that particular day is a great choice. 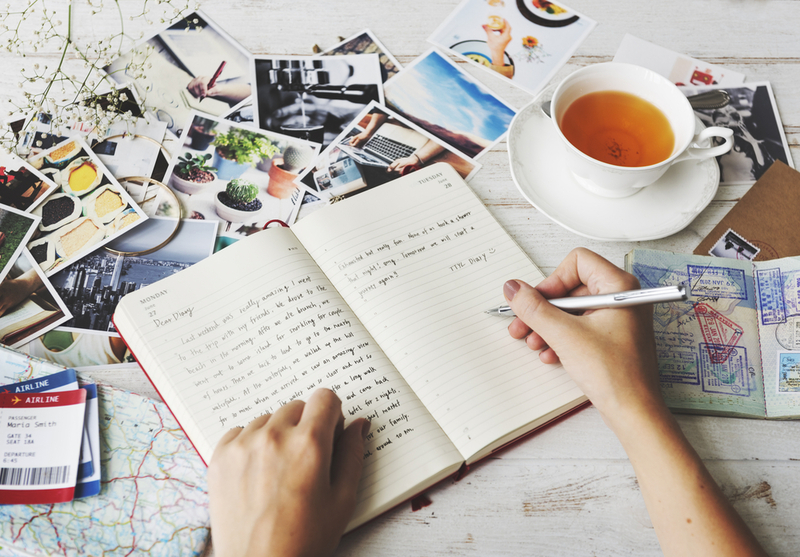 Make it your own with things that inspire you and you’ll soon find that your travel journal has changed from being a “chore” to becoming an indispensable life guide.